Any male and female 4-H member, ages 5-19 years old, may compete in the Consumer Science Purchased and Make It Mine Challenge categories. Male and female youth, ages 5-18 years old, who are currently enrolled in the Clothing and Textiles project may compete in the Traditional, Consumer Science Purchased, Box Challenge, Make It Mine Challenge, and the Retro/Historical Challenge categories. Male or female youth, ages 5-18 years old, who are currently enrolled in the Quilting project may compete in the Quilting category. This is a showmanship event. You will be evaluated on the presentation of what you have created. 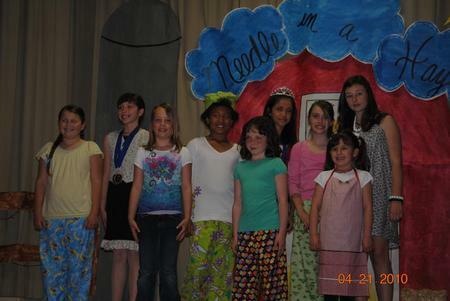 The Fashion Revue and Quilt Show is your opportunity to express what you have learned and made. Register online at: https://ucanr.edu/survey/survey.cfm?surveynumber=27010 no later than Monday, March 25, 2019. LATE ENTRIES WILL NOT BE ACCEPTED! Be sure to complete the commentary online. 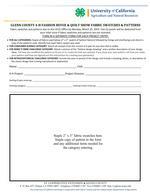 Submit fabric swatches (2” x 3” square) and pattern on the form provided to the Cooperative Extension Office by the deadline or 5 points will be deducted from your total score. Don't forget to turn in the Fabric Swatches and Patterns Form 2019 to the UCCE Office by Monday, March 25, 2019 by 6:00 p.m. The commentary you write about the project that you created will be read when you model/present your item during the Fashion Show. Please provide the information about both the model and the outfit. Commentary will be read and may be edited by the committee. 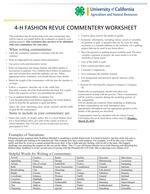 Please reference the Fashion Revue Commentary Worksheet before writing your commentary! "It's the 4th of July for Mary Smith every time she wears this patriotic suit and she has a right to celebrate! The jaunty jacket sports shiny star buttons on the bright red wool. What a great idea! The scraps from that jacket turn into patch pockets on the military blue dress. 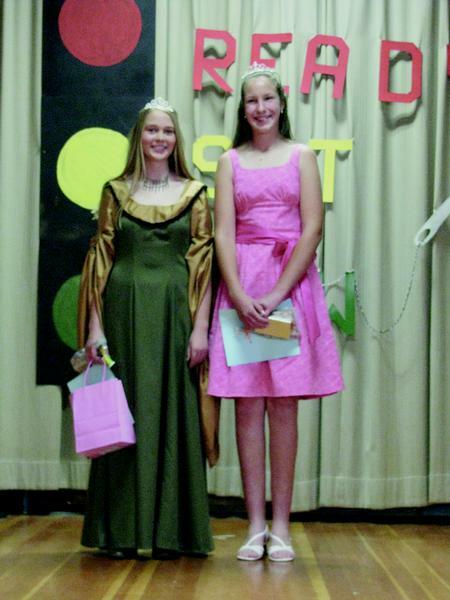 Mary has had 6 years of 4-H sewing and foods projects, but always finds a new challenge. She made this suit during a thunderstorm, finishing just before the electricity went off. Can you imagine how great this outfit will be at Davis, where Mary will be a freshman this fall?" Give information about the member and his/ her interests, such as where he or she is from, other 4-H projects, years in 4-H, future plans, summer job, etc. Give inspiration for, reason, or occasion for which outfit was planned. This could be the theme for the commentary. Keep sentences short and easy to read. Use questions and exclamations to give more variety to tone of voice. Create an appealing mental picture with descriptive words. Tell the biggest challenge you encountered in sewing the outfit; what new sewing technique you learned. Add some humor, something amusing that happened while sewing. Example: In her rush to finish the dress, Katie put the zipper in upside down. Read description of clothes in fashion magazines to get more fun ideas. As you complete your commentary, read it aloud. Does it flow smoothly? Is it easy to read and say? Please proof read before submitting. Youth may enter a maximum of two entries. Entries must be in separate categories. Garments must be made in this current 4-H year, under direction of a 4-H leader. 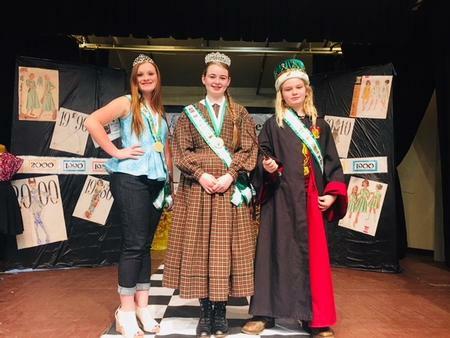 Outfits are evaluated both on stage and up close using the rubrics and evaluation forms provided by the State Fashion Revue Committee. 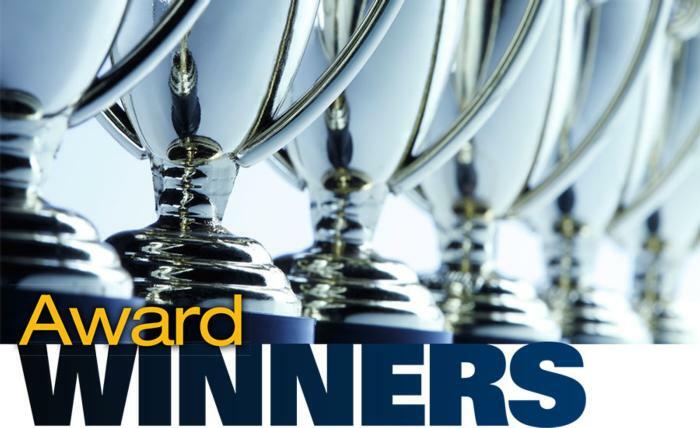 Primary members are not evaluated (they will receive comments only and all will be given the same award). Traditional - Participants in this category will construct garment(s), showcasing sewing skills and the ability to coordinate an outfit. The outfit must contain at least one constructed garment; participants are encouraged to construct additional garments to complete the outfit. 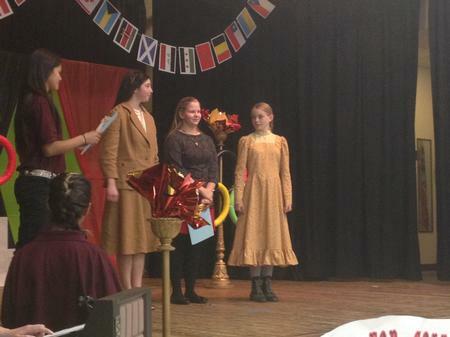 The garment(s) in this category must be sewn by the member as part of the Clothing & Textiles/Sewing Project. Consumer Science Purchased - $40.00 Limit - Participants in this category will shop for an entire outfit with the total cost not to exceed $40.00, including shoes but not sales tax. Receipts from the current 4-H year are required for any item that is visible. Gifts, prior purchases, and items without receipts are not eligible for this category. Receipts from yard sales, etc. may be hand written. The member should consider value vs. cost, versatility, the shopping experience, and coordination of the outfit within the cost limit. There is no 4-H project requirement; any 4-H member may enter this category. Box Challenge - NEW FOR 2019 - Red, White & Blue - Participants in this challenge will sew one or more garments that contain 3 colors – red, white, and blue. If one garment is sewn it has to contain all 3 colors. If more than one garment is sewn, the sewn garments together must contain the 3 colors. The fabrics(s) may contain other colors but the predominant colors must be red, white, and blue. Make It Mine Challenge – NEW FOR 2019 - Participants in this challenge will alter a commercial pattern or make your own pattern to achieve the fit and style you desire in a garment of your choice. Retro/Historical Inspired Challenge - NEW FOR 2019 - Participants in this challenge will create an outfit that is inspired by or looks like an old design using new fabric and notions. For this category, the design should be from before the year 2000. The entry must state the year or period of the design and include a drawing, photo, or description of the classic design that is being reproduced or duplicated. Add accessories to complete the outfit that are reminiscent of that time period. The outfit must feature at least one handmade garment made by the member. Other pieces of the outfit must be representational and recognizable as belonging to the same era as the handmade garment. The garment(s) in this challenge must be sewn by the member as part of the Clothing & Textiles/Sewing Project. 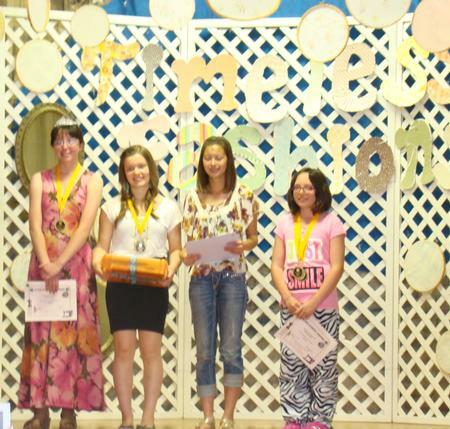 Youth may enter any quilted item completed under the direction of their quilting leader. Quilts must have a 4” sleeve attached to the back to display the item. Outfits are subject to review for modesty and appropriate attire. Formal wear may be strapless or have spaghetti straps. Backless dresses, excessive visible cleavage, visible undergarments, lingerie or swim suits are not permitted. All shorts, skirts, dresses, etc. must be at least fingertip length. All outfits must be suitable for comfortable walking, sitting, and going up and down stairs. 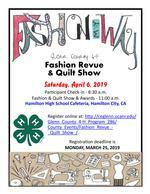 Please reference the 4-H Dress Code online at: http://4h.ucanr.edu/files/210170.pdf. Garments may be worn prior to evaluation but should be laundered or dry cleaned to not show soil. Participants are divided by category and age group for evaluation. 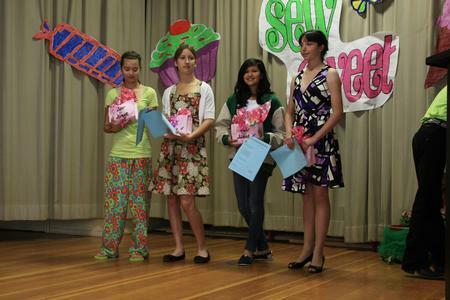 Fashion Revue & Quilt Show evaluation is based on overall appearance and expression of personal style while the participants wear their outfits. Quilts are evaluated on a display rack with youth present. Each participant briefly tells the evaluators about the outfit being worn and what was learned: no longer than 30 seconds (no note cards). Participants should be prepared to answer questions from the evaluators. The evaluators will review the entry information, documents and photographs. Evaluation is closed to the public. The commentary is not read during the evaluation. 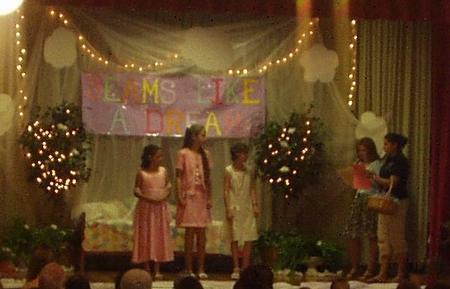 It is read during the Fashion Revue & Quilt Show. Attending the modeling practice is required for first time participants of Fashion Revue. If you cannot make it to the practice, please call the UCCE Office at 865-1107. Clothing members do not need to bring the items made, but they do need to bring their shoes to practice walking up stairs and on stage. Quilting members can drop off their quilts the night of practice or take them to the UCCE Office during the week of the event: Monday (between 8:00 a.m. – 6:00 p.m. and closed from noon to 1:00 p.m. for lunch) or Tuesday – Friday (between 8:00 a.m. - 5:00 p.m. and closed from noon to 1:00 p.m.). 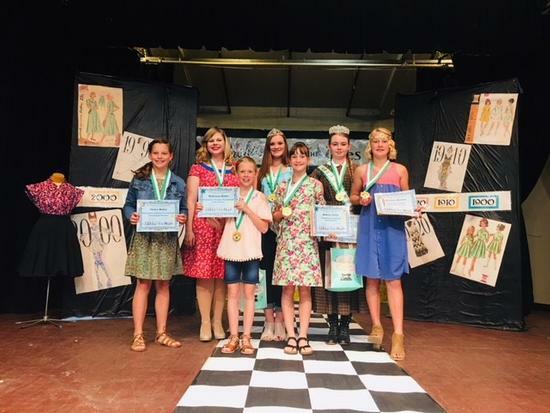 The Fashion Show provides participants the opportunity to showcase their final product in front of family, friends, and the 4-H community. Each member models on stage while the commentary is read. 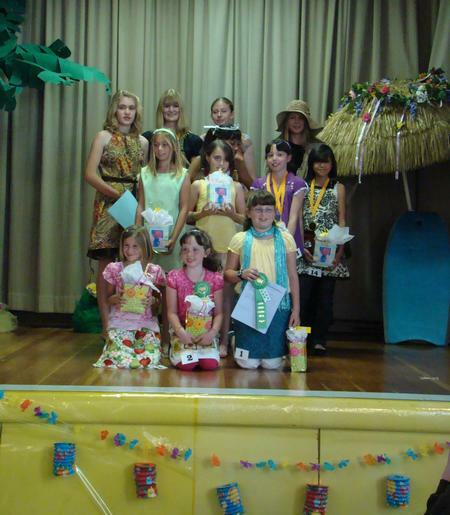 The Fashion Show is an integral component of this event. All participants must model in the Fashion Show or awards will be forfeited. Participants with quilts will stand next to their quilt as the commentary is read. 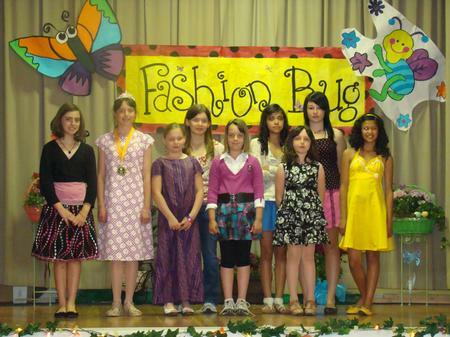 The Fashion Show is open to the public and is followed by the presentation of awards. Please invite your family and friends. Every participant will receive an award. Primary members will receive a participation certificate. All other participants will receive a medal. GOLD MEDAL: A gold is given to those entries or members who most nearly meet the standards established for the particular class or level of performance. Excellent indicates a high degree of achievement toward the elements in the standards for the exhibit. BLUE MEDAL: The second or blue grouping indicates those exhibits or individuals who rank very good in relation to the particular standards or expected achievement of the class or contest. 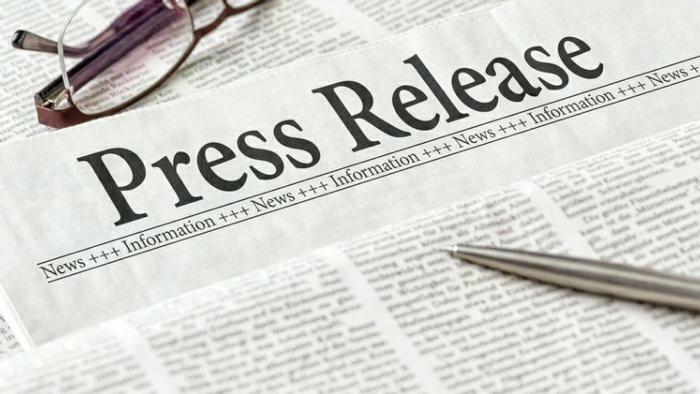 Either the general level of the accomplishment is less than excellent or enough specific shortcomings are found to cause the placing to drop form excellent to very good. RED CERTIFICATE: The red grouping contains those exhibits or individuals who upon evaluation rate average, acceptable, or satisfactory for the standards established. These exhibits have room for improvement. WHITE CERTIFICATE: May be given if exhibits or individuals who for one reason or another fail to produce that level of achievement which can be reasonably expected in relation to the specific class or performance in which they are entered. CLOTHING SENIOR DIVISION: To be eligible, you must be entered in the Senior Division (Traditional Clothing Category) and receive a gold medal. The top scoring individual will be crowned Senior King/Queen and will receive a medallion. QUILTING SENIOR DIVISION: To be eligible, you must be entered in the Senior Division (Quilting Category) and receive a gold medal. The top scoring individual will receive a medallion. CLOTHING INTERMEDIATE DIVISION: To be eligible, you must be entered in the Intermediate Division (Traditional Clothing Category) and receive a gold medal. 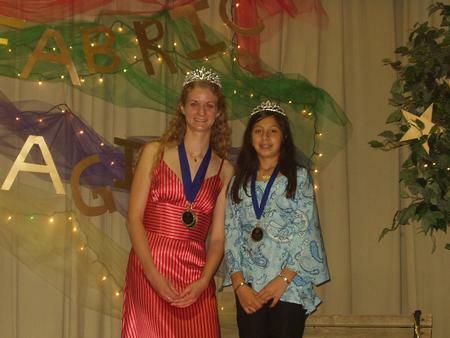 The top scoring individual will be crowned Intermediate Prince/Princess and will receive a medallion. QUILTING INTERMEDIATE DIVISION: To be eligible, you must be entered in the Intermediate Division (Quilting Category) and receive a gold medal. The top scoring individual will receive a medallion. 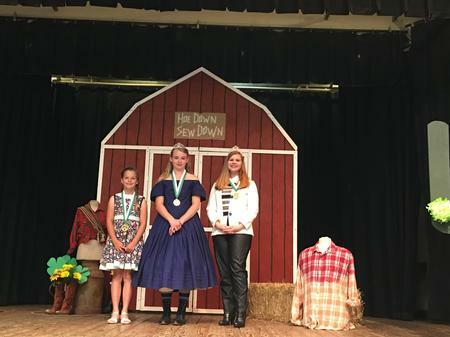 CLOTHING & QUILTING JUNIOR DIVISION: To be eligible, you must be entered in the Junior Division (Traditional Clothing Category & Quilting Category) and receive a gold medal. The top scoring individual will receive a medallion. 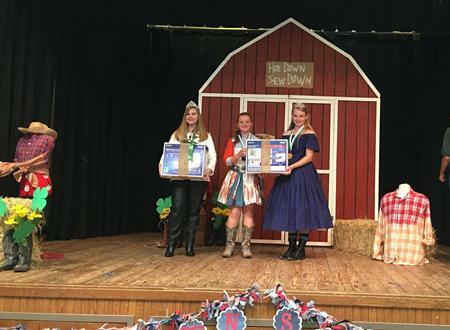 CLOTHING & QUILTING TOP OVERALL AWARD: The individual with the highest score out of the clothing divisions (Junior, Intermediate and Senior) will receive a sewing machine! All members are welcome to participate in this amazing community service project opportunity! 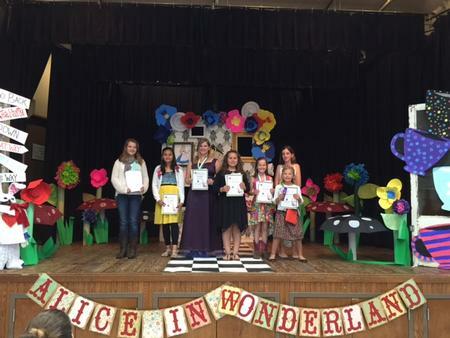 Service projects can be dropped off at the UCCE Office before Friday, May 31, 2019 or brought to the Fashion Revue Event. 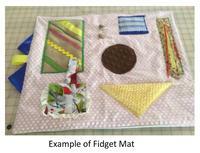 State Fashion Revue is coordinating two service projects for 2019: Fidget Mats for Alzheimer's Patients and Pet Play Toys for Animal Shelters. 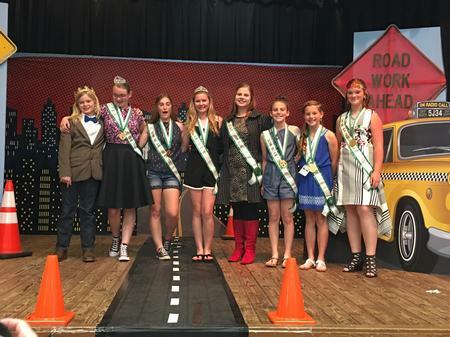 Members qualify to enter SFR at their county Fashion Revue. 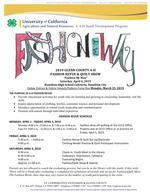 Entry is by online registration only at http://4h.ucanr.edu/4-H_Events/SFD/SFR/. The entry deadline is Monday, May 15 at 5:00 pm. Entries must be completed and submitted by this time to be considered. Entries will be confirmed by the SFR Registrar via email after entry is complete and eligibility is confirmed by the county.